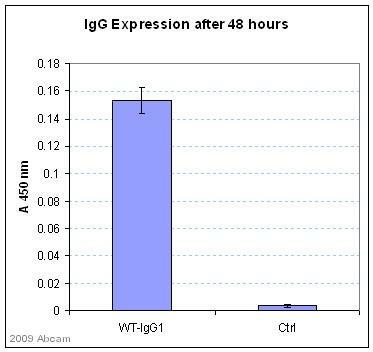 The unconjugated immunoglobulin gives a single arc when tested by IEP against human serum. Identity has been confirmed by double diffusion (Ouchterlony) against human serum and an anti- HumanLambda of known specificity. The immunogen used was human lambda-chain, purified from disease state urines and shown to be homogeneous by SDS-PAGE. The following points should be observed when using this product: 1) Dilutions of the conjugate must be made in a suitable buffer (e.g. 0.15M Phosphate buffered saline,pH7.2) 2) It is recommended that dilutions of the conjugate are made in polypropylene or polyethylene containers. Other materials (e.g. polystyrene, some grades of glass) may be detrimental to the conjugate. 3) Working dilutions of the conjugate should be prepared immediately prior to use. 4) Peroxidase conjugates are adversely affected by the presence of sodium azide, the use of which shouldtherefore be avoided. 5) The addition of Tween 20 (0.05 – 0.1%) to the conjugate diluent buffer is recommended to prevent nonspecificbinding in EIA. It may also be advantageous in other assay systems. Our Abpromise guarantee covers the use of ab9007 in the following tested applications. All five immunoglobulin classes share the same basic four polypeptide chain structure of two heavy-chains and two light chains. There are five heavy chain types, and two light-chain types (Kappa and Lambda) both having a molecular weight of 22.5kDa. Any heavy-chain type can associate with either light-chain type, but on any immunoglobulin molecule both light-chains are of the same type. Kappa and Lambda consist of a variable region and a constant region and can easily be differentiated by the antigenic properties of the constant region. The ratio of Kappa to Lambda is 70:30 , the vast majority of which is bound to heavy-chain in immunoglobulin. In normal individuals low levels of free light-chain arepresent in serum (kappa, 1.6-15.2 mg/L; Lambda, 0.4-4.2mg/L), with the occurrence of multiple myeloma or other B-cell malignancies these levels can be greatly elevated and can be found at high levels in the urine (Bence-Jones proteins). Lane 1 : Reduced samples (Conditioned medium from HEK293 expressing recombinant Lambda light chain). Lane 2 : Non-reduced samples (Conditioned medium from HEK293 expressing recombinant Lambda light chain). The 25 kDa band correspond to the reduced form of Lambda light chain. Please refer to abreview for further details. ab9007 has not yet been referenced specifically in any publications. Publishing research using ab9007? Please let us know so that we can cite the reference in this datasheet.